I love travel: it lifts you out of the everyday, puts a fresh perspective on your life, and opens your mind and heart to new possibilities. But one thing that doesn't go on vacation is my commitment to feeding my family healthy meals. It's one of those positive feedback loops: eating well contributes to happiness, being happy takes a lot of energy - we are never hungrier than when on vacation. Photo Silver Spoon: Who says eggs have to come in dozens? But it's not always easy: when I'm at home I know exactly where to go for clean, whole foods: my CSA farm, my milk farmer, the local health food store. When we're travelling all that familiar routine goes out the window and I get to re-invent our food on a daily basis. One thing I've learned from bitter experience, is not to expect real food at child-oriented venues like zoos or theme parks. I really don't see why children's taste should be so insulted that they are exclusively served fat-soaked and sugar-laden "food". I don't even see why there should be a "Kids' menu" at restaurants: my children eat what I eat, only with smaller portions. To tell the truth, on one road trip I gave up and stopped at a burger chain, just to be different. CelloDad was surprised. CelloPlayer was bemused but tried this and that. ViolaPlayer categorically refused to eat anything. Even passed up on the bottle of water. Having gone through the Food & Health block at our Waldorf school, and having read Fast Food Nation, my child chose to go hungry rather than submit to the industrial fast food. I have to admire that. So back we went to our wholesome food regime. This gets easier as you have more money to throw at the issue, but there are plenty of healthy food options that don't cost an arm and a leg. A friend of mine once went on a trip across France with Michelin's restaurant guide in his hand. This friend is French, as well as a serious foodie: the kind that would row to an island in the Channel just to buy a few kilos of a certain potato grown organically on a particular field, ideally situated for cosseting by the kind climate of Brittany's coast. My foodie friend spent ten days from Marseille to Strasbourg hopping from one starred restaurant to the next. Since many of these restaurants put an emphasis on local and organic, his meals on this trip were probably very good in all senses of the word. But my guess is that he spent a faint-inducing amount on food for the trip. But even without the Michelin guide (or Routier's, or Zagat's), we don't need to rely on fast-food chains for our on-the-road meals. We now have yelp, and google maps, and other online food finders where - this is the crucial part - patrons leave feedback. All it takes is a smartphone (or some homework before the start of the trip), and you can always find a restaurant where you can have a great meal made from fresh, local and "clean" ingredients, sometimes in the most remote of small towns. More often than not, these places are very comfortable and homey, and have prices that are much more palatable than those of Michelin-starred restaurants. 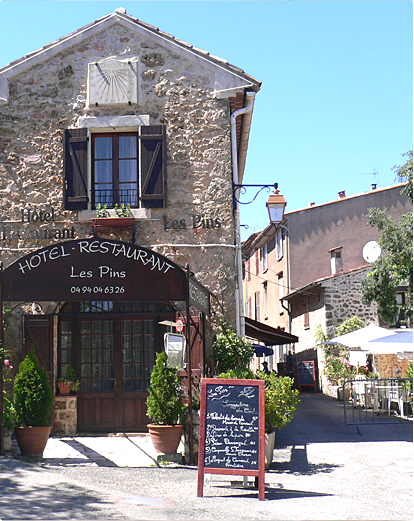 We once ended up having lunch at the only restaurant in a tiny village in the middle of nowhere in the south of France. We were on the third glorious course, with excellent wine, when our toddler fell asleep. The owners bustled about to convert two chairs plus some pillows into a comfy napping nook so that the toddler's parents could continue with the meal. We spent three hours over that lunch, and still talk about it. I like to believe that the advent of internet-based customer feedback will eventually make fast-food chains obsolete. We only relied on them on our road trips because they were convenient and cheap, and our psychological makeup is such that we are more willing to swallow mediocre but uniform quality, rather than to go for the potential excellence of an unknown mom&pop eatery. But with our smartphone in hand, we have a good idea of what a diner is like, before we've ever even seen it, and whether it's worth making the 10-mile detour to get to it. We can have real food wherever we go. That same smartphone can also help us find the farmers' markets where you can sample what's local and fresh - sometimes it may not be your cup of tea (sixteen kinds of cuttlefish, ugh), and sometimes you will find unusual delicacies that you wouldn't find anywhere else. If there are no farmers' markets, we just find the health food store, or even the grocery store with an organic section in the produce aisles. Many of these have delis stocked with take-away foods that are just as convenient as conventional fast food, but much better for you, and often less expensive. If you have a way to cook on your travels, you can make your own meals from scratch. When we go camping we never have to eat in a restaurant. We have our camping stove, and a small fridge that plugs into the 12V outlet in the trunk: we're set. Eating this way is not more expensive than cooking at home, and like at home, you know exactly what goes into your meal. But in the outside air, everything tastes ten times better. When staying in hotels, cooking for yourself is not part of the package. That's why, when we're not camping, my family prefers to stay at apartments or cottages: those tend to be very comfortable, often the weekly rate is less expensive than staying at hotels, and they come with a complete kitchen. Usually the owner will provide a list of farmers' markets in the area. Whatever we do for our main meals, our snacks are home-made or bought at a grocery store - unless we find some scrumptious local specialty, or some luscious fruit at an organic farm stand (my dad once bought a crate of apples straight from the orchard; that crate was our snack box for the trip). We pack finger-food goodies in small glass jars or in cookie tins; road trips are just about the only time I allow snacking in the car. We each have a water bottle at our respective seats, refilled at the tap in the morning and cleaned every evening, so we don't have plastic bottle waste. Care to share your tips for healthy eating on the road? That said, when on the road, I'm a supermarket shopper like you said, and can usually scrounge together something relatively wholesome. My favorite vacation foods are when in Italy - find the market hall, usually an indoors venue but feels like a farmer's market with a roof on top. Buy smoked mozzarella, tomatoes and bread. EAT. One of my favorite childhood memories is my parents taking us to the fish market at dark-o-thirty in the morning, in Brittany, France. We listened to the fish auction and my dad would buy as all the cooked fresh shrimp we could eat. Heaven. Food makes for some darn good memories. hi Kath, thanks for the tips! When travelling I loosen the organic requirement, but do choose it when I can - a bit of research ahead of time always helps. There are a few places in the world where you actually have to work hard to find bad food: Brittany is certainly one, also Italy outside most large cities (inside you need a good guide), and almost everywhere in Japan. But the US is on the other side of the spectrum: friends of mine were at a "child-friendly" theme park and said the only veg they saw all long weekend was a plate of deep-fried broccoli. Ouf. Arent't children wonderful? they all have the best of taste - in the beginning. Cooking your own meals is one of the best and most inexpensive ways to eat healthy while on vacation. Many hotels offer kitchens in some of their rooms. "I Go to the Gas Station Once a Month"